Atomic Tomato potato chips – tomato sauce (ketchup) flavoured loveliness. I dog ear a page if a line really makes me think or chuckle, I only write in a book if it's my class text. A bit of both, but I “bookmark” with receipts or pens. Only if I am pausing for a short break. Hard copy all the way – the feel, the smell, the weight are all much better than an anchorless voice. Chapters schmapters, I usually read books in one hit. If I do stop, it’s at the next full stop that I come across. That happens very rarely and if I don’t, I can work it out from the context. The question just posed....I know I am hysterical :} Seriously though, Devil's Kiss by Sarwat Chadda. It’s an interesting take on the Knight's Templar plus some supernatural content. Looking for Alibrandi by Melina Marchetta. I wanted a new copy for her to sign as my original is twelve years old and rather beaten. On the bus, to and from work. The gentle (cough jerking cough) sway of public transport is strangely effective in the rate of pages I can churn through. Stand alone. Series books should be able to stand alone regardless, though they often don’t. ‘The Marchetta’ aka Melina Marchetta – she’s the reason I fell in LOVE with Australian YA. 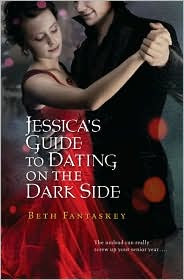 Also debut author, Beth Fantaskey, whose ‘Jessica’s Guide to Dating on the Dark Side’ is only now making a dent in the blogosphere but is a breath of fresh air in the musty* bit lit genre...and it is genuinely touching and funny. *By musty, I mean stale. By stale, I mean it's full of caricatures and cliched storylines - I like something that approaches a well known genre from an angle rather than "spins" work already written by LJ Smith, Anne Rice or Bram Stoker. I have two bookcases – one for TBR and one for everything else - but now a few more bookcases are required. The top shelves are for urgent reading in the TBR bookcase but other than that there is no logic. At first I tried to order them by country of origin and then in order of when I needed to review them but now it’s a big old mess. See? I am more frustrating than interesting. I felt like I've had ten minutes on a psychiatrist's couch and come out better and wiser. I also suddenly have the burning need to order my bookshelves....hmmmm. Fun interview! Thanks for helping me get to know Wendy a little better. I envy your ability to read on public transport! I pretty much have to have complete silence when I read, or I can't concentrate. By the way, I love this new layout even more than the last one! You've introduced me to so many new YA books and authors. It's not been a good thing for my TBR list. I think it's ironic that I love lists and organization and structure yet my books are in chaotic piles all around my living space. The point of me saying this is that I like how you have your book space constructed. I'm going to have to do the same. So wishing I could read in moving vehicles too. Nice job on the meme. Reading on the train is pleasure, reading in the car is sickness..for me. Have not heard of Melina Marchetta, must look into her. I don't know any of these YA books! I have to find these potato chips you mention...will go well with my Diet Coke and M&Ms while reading! Thanks for sharing! I too love "The Marchetta." Knight's Kiss sounds very interesting! I'm a snacker while I read, too. And I dogear. Ketchup potato chips? Seriously? Ewwwww.